New England Patriots tight end Rob Gronkowski (middle), pictured during the AFC Championship game against Denver in January, has had his contract option picked up by the team. Rob Gronkowski is under contract with the New England Patriots through the 2019 season after the remainder of a $10 million team option was picked up on Monday. The All-Pro tight end turns 27 in May and has 65 touchdowns receptions in his first six seasons to go with 380 receptions for 5,555 yards. The Boston Herald first reported the Patriots picked up the final $6 million option. The Patriots signed Gronkowski to a six-year, $54 million extension in 2012 and the final four seasons of the deal were tied to a two-tier team option. Gronkowski can increase the original outlay of guaranteed money from $13.17 million with the additional bonus figures tacked on. He caught eight passes for 155 yards and a touchdown in the AFC Championship game loss to the Denver Broncos and had 72 receptions for 1,176 yards and 11 touchdowns in 2015. 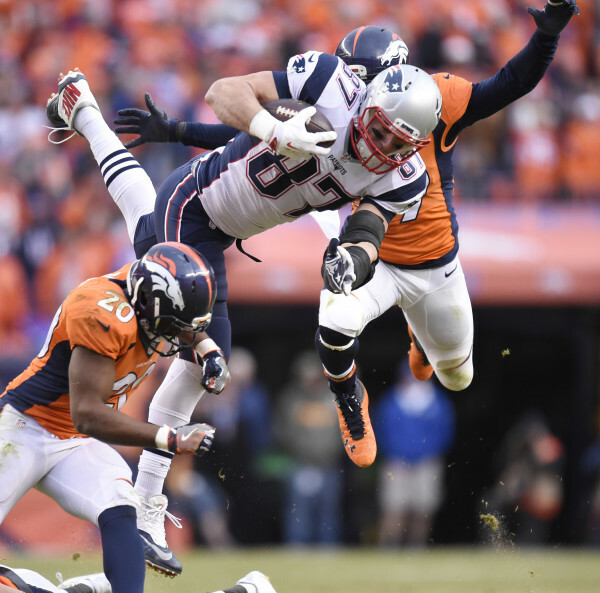 Gronkowski has 23 touchdown catches the past two seasons. Seven-time Pro Bowl guard Logan Mankins informed the Tampa Bay Buccaneers on Monday he plans to retire. Mankins spent the past two seasons with the Bucs after playing nine seasons with the New England Patriots. Mankins went to the Buccaneers in a trade that caught him by surprise in 2014. He eventually focused on the job and started 31 of 32 games the past two seasons. Mankins was named All-Pro six times. Mankins said in January while preparing for his seventh Pro Bowl in Hawaii that he was leaning toward retirement but wanted to take extra time to be certain that was the right call. His retirement clears nearly $7 million of cap space for the Buccaneers, who have needs all across the offensive line minus Mankins. However, the move is not a surprise to general manager Jason Licht, who said in February at the Scouting Combine that Tampa had prepared for all outcomes in Mankins’ situation. A first-round draft pick in 2005, Mankins was one of the most consistent players in the Patriots’ offense and was traded because of a lingering contract dispute with the front office. The Washington Redskins, as expected, released quarterback Robert Griffin III on Monday, according to multiple reports. The Redskins informed Griffin of their decision on Monday morning. By releasing Griffin before Wednesday’s start of the new league year, the Redskins save $16.155 million. The Redskins had extended Griffin his fifth-year option in April 2015. The Redskins reportedly held trade discussions with two different teams last week involving him. The 26-year-old Griffin, the No. 2 overall selection in the 2012 NFL draft, sat the entire season as Washington’s No. 3 quarterback and watched Kirk Cousins take control of the quarterback job with a breakthrough year. Cousins signed the one-year, $19.95 million tender offer from the Redskins, who applied the franchise tag to the pending free agent last week. After leading the Redskins to the playoffs in his rookie season of 2012, Griffin struggled because of injuries and poor play. He has career totals of 8,097 yards, 40 touchdowns and 23 interceptions.